In one of its "shortest meetings ever," the City Plan Commission recommended letting North Avenue rise higher. Future buildings along North Ave are likely to be taller thanks to a zoning change recommended for Common Council approval today. In a special meeting, the City Plan Commission unanimously recommended for approval a zoning change for the area east of the Milwaukee River around E. North Ave, which would raise both the minimum and maximum heights for its buildings. 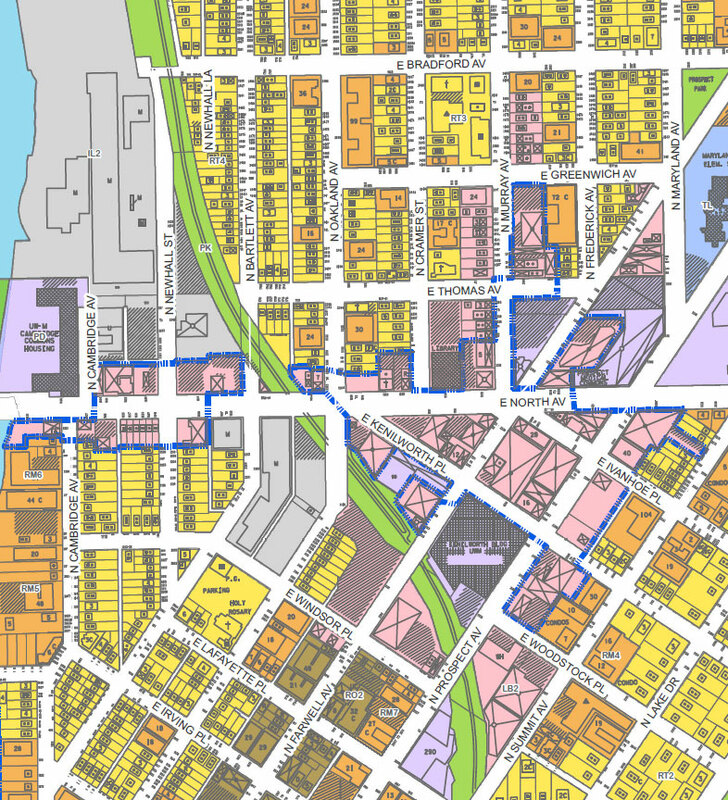 The area’s zoning classification would change from Local Business 2 (LB2) to Local Business 3 (LB3), raising the minimum heights for buildings to 30 feet (up from 18), and the maximum heights to 75 feet (up from 60). 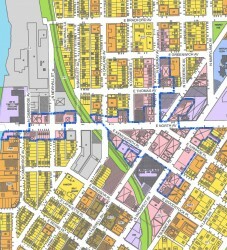 Map of the proposed area to zone LB3, prior to the removal of a portion of N. Murray Ave. The special meeting was held solely to pass this specific proposal. During the prior meeting of the City Plan Commission, the proposal was held on a 3-2 vote because of neighborhood concerns over the notification process and the inclusion of the east side of one block of N. Murray Ave (between E. Thomas Ave. and E. Greenwich Ave). Cindy Kluge, speaking on behalf of the Greenwich Village Neighborhood Association, supported removing that block from the plan and an amendment was offered to do so. But Kluge still asked for the matter to be postponed until the neighborhood association had more time to review the proposal. The removed section on the east side of N. Murray Ave would see its zoning classification stay at LB2 with a minimum height at 18 feet and a maximum height of 60 feet if the measure is ultimately approved. The special meeting clocked in at under five minutes, leading Commission Chair Patricia T. Najera to quip “this might be the shortest meeting ever.” No representatives from any area neighborhood associations were present. The Greenwich Village Neighborhood Association had commented on the proposal via email, indicating that they were fine with the removal and were not seeking any further meetings on the matter. Alderman Nik Kovac, who represents the affected area, noted that he had spoke with several members of the association since the original hearing on May 21st. The special meeting was held to continue to push the legislation forward in advance of a proposal for the Prospect Mall property. The proposed zoning change will now be taken up by the Zoning, Neighborhoods & Development Committee on June 5th where it is very likely to be approved. The new zoning designation would also require a greater street frontage and taller ground-level windows. For those thirsty for more details, DCD has produced a presentation in PDF format that further explains the new LB3 designation.